There is a large guest lounge - complete with TV, book swap library, games (Trivial Pursuit, chess, backgammon etc..) and brochures for all the tour operators in the area. Almost all the tour operators pick up and drop off for free at the Lodge. We have a resident cassowary that visits the Lodge on a daily basis - so if you have not seen this magnificent and endangered bird in the wild - this is your chance. Other wildlife around the house include a pair of nesting Yellow Sunbirds and a very inquisitive Rusty Monitor. Mission Beach is blessed with several excellent restaurants which are all close by. 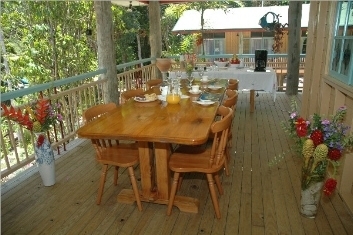 If you are a bit tired of eating out, we have cooking facilities and a couple of BBQs, and you are welcome to have your dinner on our upper verandah overlooking the floodlit garden. So what else do you get for your money Well, we serve the yummiest breakfast on offer in all Queensland (probably !!). If you really insist, you can have a go on our ride-on mower - about two hours should do the trick. Laundry facilities are here, iron and ironing board (surely not on holiday ) and of course Wireless Internet. Fully ensuite, a big shower with shower door. There is a separate TV lounge to the bedroom. 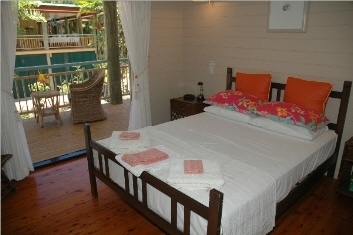 The bedroom has a King bed, fridge, alarm, hairdryer, ceiling fan, fluffy towels and verandah that overlooks the award-winning tropical garden. 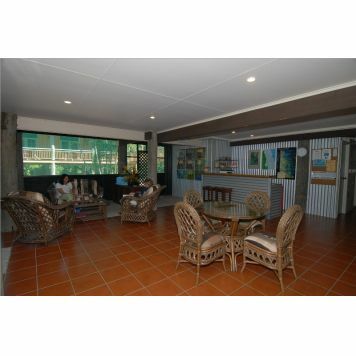 The lounge has a sofa bed, TV/DVD player and verandah. The King Suite is ideally suited for two or three people. Great swimming pool with waterfall feature. Daily visits by the magnificent Sothern Cassowary. Tariff includes a wonderful breakfast. 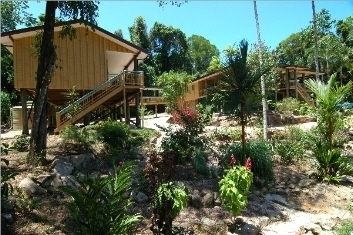 Fully ensuite, a big shower with shower door (not one of those horrible clingy shower curtains) , fridge, alarm, hairdryer, ceiling fan, fluffy towels and verandah that overlooks the award-winning tropical garden. Great swimming pool with waterfall feature. Daily visits by the magnificent Southern Cassowary. Tariff includes a wonderful breakfast. Check in can be as early as 1100 am. Just phone to see if we can oblige. Check out is normally 1000 am. Late check out is possible. All our Queen rooms sleep two people comfortably. An extra bed can be added to a Queen room, but it is a bit of a squeeze. But you must contact us either by email or phone to see if a third person can be accommodated in a Queen room, as we have a limited number of beds that can be added to the Queen rooms.The King Suite is a much better proposition for three people, as the bedding configuration for the King Suite is one King bed and one sofa bed. 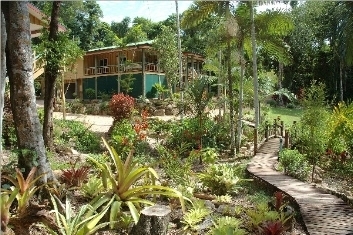 Travelling South along the Bruce Highway, it is a 90 minute drive through beautiful tropical North Queensland. After an hour (or less) of travelling you will arrive at the fairly large town of Innisfail. Keep on the Bruce Highway - there is a right turn to be made as you leave Innisfail (signposted Tully) in order to stay on the highway. After about 40 minutes or so, you should come across the township of El Arish, and there is a left turn for Mission Beach. Follow the road (for about 14 kms) and just before entering Mission Beach you will pass a Mitre 10 and an Auto Spares shop on the right. 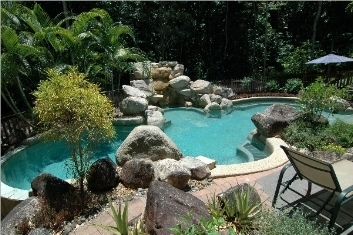 Immediately after the shops take a right (signposted Cassowary Drive, Wongaling Beach, South Mission Beach, Tully). About one km on the right is Mission Circle - which has one of those blue B&B Accommodation signs on the corner. Simple! If you get as far as the Woolworths roundabout, then turn back - you've gone too far. A 2.5 hour drive North on the Bruce Highway, passing the spectactular Hinchinbrook Island. Just after the town of Tully there is a right turn for Mission Beach. Follow that road for approx 22 kms. You will come to the Woolworths roundabout. Head straight on - Mission Circle is the third left after you pass the roundabout - about 1 km. It has one of those blue B&B Accommodation signs on the corner and a big yellow road sign on the left corner. Too Easy! Lots to do in Magical Mission Beach, both for the adventurous and not-so adventurous. Mowing the Lawn - Ride-on mower provided. Free lessons.